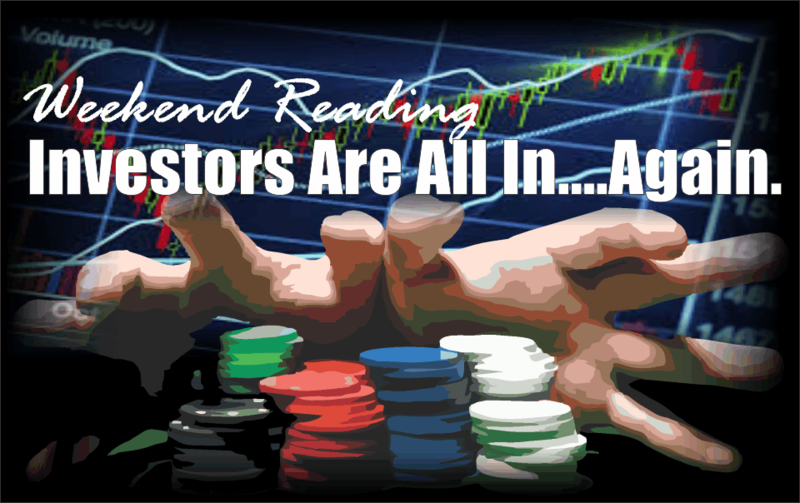 Weekend Reading: We Are All In….Again! Despite the recent angst in the market over increasing interest rates, there has been little evidence of concern by investors overall. A recent report showed that investors have the LEAST amount of cash in their investment accounts…EVER. “Individual investors drew down cash balances at brokerage accounts to record lows as the S&P 500 surged 7.2 percent in the three months ended Friday. The monthly survey from the American Association of Individual Investors shows the same. Individuals are carrying some of the highest levels in history of equities, are reducing their exposure to bonds, and carrying very low levels of cash. And the market once again tumbled. Households have repeatedly learned, and then subsequently forgotten, this lesson repeatedly over the entirety of the financial market history. The challenge, of course, it understanding that the next major impact event, market reversion, will NOT HAVE the identical characteristics of the previous events. This is why comparing today’s market to that of 2000 or 2007 is pointless. Only the outcome will be the same. The reality is that the majority of investors are ill-prepared for an impact event to occur. This is particularly the case in late-stage bull market cycles where complacency runs high, risk is dismissed for chasing returns, and value is displaced by momentum. The recent sell-off was NOT the impact event. That event is still coming, and the discussion of why “this time is not like the last time” remains largely irrelevant. Whatever gains that investors garner in the between now and that next event by chasing the “bullish thesis” will largely be wiped away in the swift and brutal downdraft. The routs in February and October are only early warnings of how swift and brutal the actual event will be. “Investors always decide to do the same thing, at the same time, and it is usually the wrong thing.” – T.R. Roberts.